Hoohobbers crib bedding is made in the USA using designer fabrics. Great care is taken to create linens of the highest quality including doubled ruffles and ties plus detail piping. The unique, duvet style bumpers have zippered opening to remove bumper padding for laundering. This allows the bumpers to always retain their crisp, original shape. Hoohobbers crib bedding creates a beautiful nursery. The set includes a double sided blanket backed with double knapped flannel. 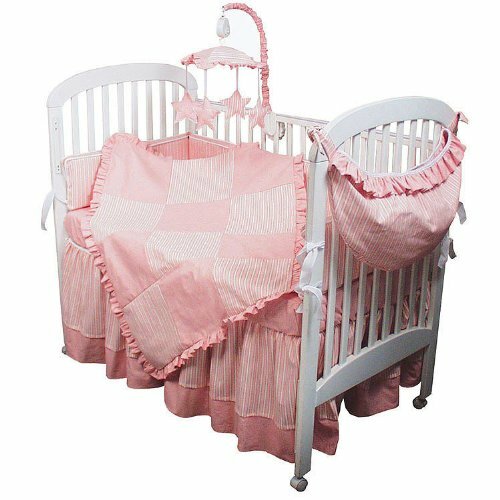 Four piece set includes 18" drop crib skirt, bumpers, blanket and sheet. Machine washable. If you have any questions about this product by Hoohobbers, contact us by completing and submitting the form below. If you are looking for a specif part number, please include it with your message.